For over 100 years, weâ&#x20AC;&#x2122;ve been bringing your ideas to life! From the sum of 113GHz, we respond to any of your applications with the appropriate radar frequency. In terms of engineering, we supply the complete portfolio of radar instruments to you and optimize your process automation. On a personal note, we tune into your wavelength to understand what exactly it is that you need for your specific processes. Your Trusted Service Provider Since 1988 Our team of local, factory trained, and experienced field service technicians are here to support all of your field Western Canada. INDEX OF SUPPLIERS NOTE: The page numbers for this On-Line PDF Version Viewed in ISSUU are different than the printed copy page numbers shown below. ADD 9 pages to the page numbers below to view the correct Ad. Cover and Tab Ads are pages 10-17 in this online version. Aircom Instrumentation Ltd. provides products and services to the process control industryâ&#x20AC;&#x201D;specializing in temperature sensor manufacturing, specialty welding and product distribution. For over 15 years, the Edmonton-based company has created solutions for the challenging applications customers face daily, earning its stellar reputation for its customer service. Cameron Instruments Inc. Calibration Laboratory is ISO17025:2005 accredited in the field of Pressure Calibration, with capabilities up to 30,000PSI. Delpro is a single source provider of Process Instrumentation, Automation and Analytical products. We supply Pipe Fittings & Flanges with CRN. Contact us for CRN assistance. Honeywell Thermal Solutions provides combustion and heating solutions that are safe, reliable, efficient and clean. Each of our brands — Honeywell Combustion Safety, Honeywell Combustion Service, Eclipse, Exothermics, Hauck, Kromschröder and Maxon have a strong legacy of providing products and solutions that help customers address their toughest challenges. HTS solutions streamline integration, installation and end-user interaction while improving efficiency and performance. www.ThermalSolutions.honeywellcom © 2017 Honeywell International Inc.
Comprehensive Solutions to Challenging Applications for Measurement, Analysis, Sampling, Flow Control, Heat Tracing. Milton Roy LINC Chemical Pumps, Milton Roy Williams Chemical Pumps, Airtech Louver Actuators, K-Dyne 7970 Pressure Pilots and Relays, McMath Hand Injection Pumps, Check All Back Pressure Valves, Graco Chemical Pumps and Solar Pump Systems, Weir ESD Systems, McMath Gas Collection Systems and Production Tank Flanges, Mallard Valves, Regulators ,Level Controls and Hydroseal PSV Valves. We at MCL provide services to some of the world's largest and most respected companies in the process, industrial, manufacturing and exploration industries. - Valve Sealing Grease  EMPHATEC - Automation System Migration Solutions  HIPPS - High Integrity Pressure Protection Systems  BMS - Burner Management Solutions NEW • The Flame-O-Matic BMS is designed to manage critical natural draft burner applications with a user-friendly display providing safe reliable startup and shutdown. • The Flame-O-Matic Ignition (IGN) Module interfaces with a PLC based BMS to ignite and prove a continuous pilot. Industrial Boiler, Burner & Control Service. Complete Boiler-House Design and Refurbishing. Design and Upgrading of Fired Process Heaters, Rotary and Fluidized Bed Dryers & Incinerators. Code compliant Burner Management Systems. Combustion Control Systems. Turnkey Burner, Fuel Skid & Control Systems. Low NOx Burners for Boilers & OTSG. Fives North American Mfg. Low NOx Burners. Fives Pillard Low NOx Burners. Fireye Inc. Flame Safeguard Control Products. Water-Tube Packaged Boilers. Representing the TOUGHEST valves and instrumentation equipment in the world! Automation | Valves | Measurement | Process Control Founded in 1963, Spartan Controls Ltd. has become the recognized leading provider of automation, valves, measurement, and process controls for all process industries in Western Canada. Our unique partnership with Emerson and other leading solution providers allows us to connect customers with world-class solutions, superior technical expertise and full life-cycle services. As a Canadian, employee owned company; our project experience spans multiple industries. Our single point of customer contact reliably reduces interfaces, improves the customer experience and allows us to quickly apply best-in-class technologies and services to meet our customerâ&#x20AC;&#x2122;s automation challenges head on. We invest to earn your business; we invest more to keep it. MCG 1600SFI with Antennas for Every Application Years of experience have enabled L&J Engineering to provide the optimal antenna configuration for a given application. Four antenna designs (parabolic, cone, and two stilling well configurations) accommodate various process parameters which include surface conditions, height to measure, dielectric constant of product and internal obstructions. L&J engineering’s MCG 1600SFI radar gauge offers customized, cost effective solutions for your level gauging needs. With a wide range of level gauging products, L&J provides quality equipment for the Petroleum, Petrochemical, Chemical, Marine, Food, Pharmaceutical, Pipeline, Wastewater, Steel and Waste Treatment Industries. The future is 80 GHz VEGA has changed process instrumentation with its latest radar technology: 80 GHz transmission frequency. This frequency keeps the radar beam focused on the product, avoiding internal obstructions like heating coils and agitators. Unaffected by condensation and buildup, the 80 GHz VEGAPULS 64 and VEGAPULS 69 represent a new generation of level measurement technology. Whether measuring liquids or solids, these radar sensors help you focus on the essential. www.vega.com/radar Wireless adjustment via Bluetooth with smartphone, tablet or PC. Compatible retrofit to all plicsÂŽ sensors manufactured since 2002. W J F Instrumentation Ltd. 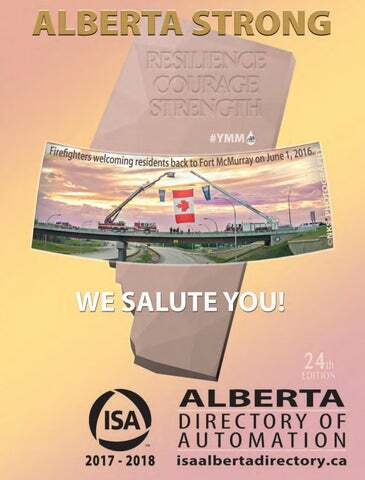 Serving Canadian industries for 160 years. WAJAX PROVIDES A COMPLETE OFFERING OF PRODUCTS AND SERVICES TO MEET YOUR NEEDS. ADVERTISING RATES All rates include print ad and online profile. ONLINE COMPANY PROFILE Secure login allows you to update & edit your company profile any time throughout the year. Access tracking & statistics for profile views, website click-throughs, and featured supplier clicks, to confirm valuable ROI. ADDITIONAL WEBSITE ADVERTISING OPTIONS Only available to Directory Advertisers. Company logo linked to your online profile page Tracking statistics available Yearly subscription - Sept. to Sept. Maximum of 7 premium pkgs available Ads rotate throughout all pages Tracking statistics available Yearly subscription - Sept. to Sept.
3 SIDE BOX AD Ads rotate throughout all pages Tracking statistics available Yearly subscription - Sept. to Sept. 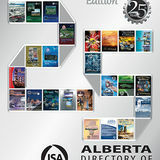 This is the 24th Edition of the directory published jointly by the ISA Edmonton and ISA Calgary Sections.